Components inside an aircraft engine are exposed to extreme stresses, and therefore made from very hard materials. 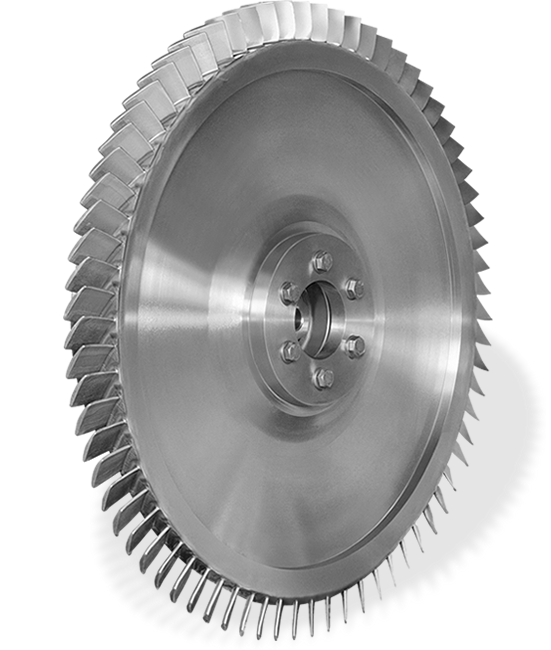 For example a Blisk (Blade Integrated Disk) is often made from nickel-based super alloys. Conventional cutting methods become uneconomical as the material hardness increases and the service life of expensive tools drops, therefore causing costs-per-piece to rise. PECM and machines by EMAG offer an elegant solution for this problem. The PECM technology supplied by EMAG ECM based in Gaildorf Germany removes material without contact and causes minimal tool wear while being fast and reliable. During the process, the workpiece becomes the positive anode and the tool the negative cathode. An electrolyte solution flows between them, removing metal ions from the workpiece. The form of the cathode (tool), with its active, conductive zones results in material removal from the workpiece at the required component contours. Ring ducts, grooves, bell hollows and other contours can be produced without contact, but with very high precision and excellent surface quality. Machines for the machining of BLISKS and single blades: EMAG ECM has two machine types for the different machining tasks of jet engine production: while the small model PO 100 SF is designed for machining single turbine blades, the larger PO 900 BF is for machining the complete, and therefore much larger, blisk. Both these machines also provide the user with central EMAG innovations such as a Mineralit® polymer concrete machine base, intelligent software and hardware interfaces and efficient automation solutions.